(PRLEAP.COM) Park City, UT - https://www.e-janco.com - Privacy Compliance Policy Meeting CA Privacy Law and GDPR Mandates Released by Janco. This is managements roadmap to mandated privacy compliance issues that all enterprises need to implement. Included is an eReader version of this policy and one electronic form to help in the administration of this policy. The CEO of Janco, Mr. M. Victor Janulaitis said, "With the push towards protection of users' contact information, internet usage, and sensitive personal information, the new California Privacy Law sets the minimum standard for user data protection and rights. No longer will vendors to able to use automatic opt-in to capture and re-market data captured from the internet without the user's direct consent." California Privacy Law forces new mandates on enterprises just as CIO implement EU's GDPR – Other U.S. States to follow. Janulaitis said, "Included within this tool is a User Bill of Rights along with specific requirements for the capture, retention, removal, updating, and maintenance of user information. It is the first U.S. based mandate for user privacy transparency. In this policy we define the platform to support user rights and enterprise requirements of the law including; 1) right to know what personal information is being collected about them and have that information removed; 2) right to know whether their personal information is sold or disclosed and to whom and how it is used; 3) right to say no to the sale of personal information; 4) the right to access their personal information; 5) right to equal service and price, even if they exercise their privacy rights; 6) Enterprise reporting requirement; and 7) Enterprise Internet and WWW requirements." The Privacy Compliance Policy is structured around user bill of rights and an Enterprise's responsibilities under GDPR and the latest California Privacy Law. It is Janco's intent to update this policy on a continual basis as new technologies are released and new privacy mandates are created by governmental bodies, industry associations (i.e. IOS), and technology provider requirements (i.e. PCI-DSS). The CEO added, "We created the Privacy Compliance Policy in concert with input from several Fortune 500 enterprises on how to help them better manage the privacy of user information and our legal advisors that have reviewed GDPR and California Privacy Law." In addition, he said "This policy can be acquired on its own, with the IT Infrastructure Policy bundle, or the CIO Management Tool Kit. Each of these offerings comes with 30 days of subscription update service or can be acquired with 12 or 24 months of the service." For more information go to https://www.e-janco.com/infrastructure.html. All of Janco's products are delivered electronically in formats that are easily customizable by the user. Janulaitis said, "We have clients in over 100 countries that rely on our leading-edge infrastructure products. We continue to be on the forefront of infrastructure management as that is the strength of the firm. Over 2,400 companies have already selected one of Janco's templates, policies, job descriptions to be the foundation for managing their IT infrastructure." More information on the policy can be found on the Janco's website at https://www.e-janco.com/privacycompliance.htm. 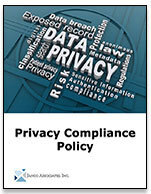 and a full table of contents can be found by registering at https://www.e-janco.com/Register_Privacy_Compliance_Policy.html. 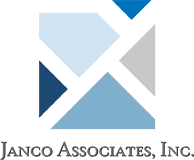 Janco is an international consulting firm that follows and addresses issues that concerns CIOs and CFOs. It publishes a series of IT and business infrastructure HandiGuides® and Templates including a Disaster Recovery/Business Continuity Template, Security Template, IT Job Descriptions, and a semi-annual IT Salary Survey.